No need to look for a 12 volt outlet. This cord enables you to use your 12 volt appliance anywhere there's a battery. 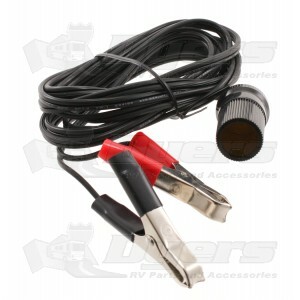 Consists of a 12 volt receptacle, 10' of wire and two heavy duty battery clips. Actually bought this for our quad. I needed a lighter plug in the rear of my quad in order to run various 12 products that we use. We were able to permanently mount this on the rear and have 12 volt power on the rear of it. Just what I was looking for! Fast shipping, great price, excellent communication by Dyers. I highly recommend doing business with Dyers!